In this level, students get an overall sense of the environment. They just figure out how to play the music and move to the next level. Give an introduction to your students on how this environment works and explain to them the activity. Notice that there are three main elements. At the top is the close button. When the student is done reading the instructions or watching the animation with the instructions they should click on that button. The instructions are in the middle and should provide the kids what to do. Some kids don&apos;t like to read and may prefer looking at the animation. 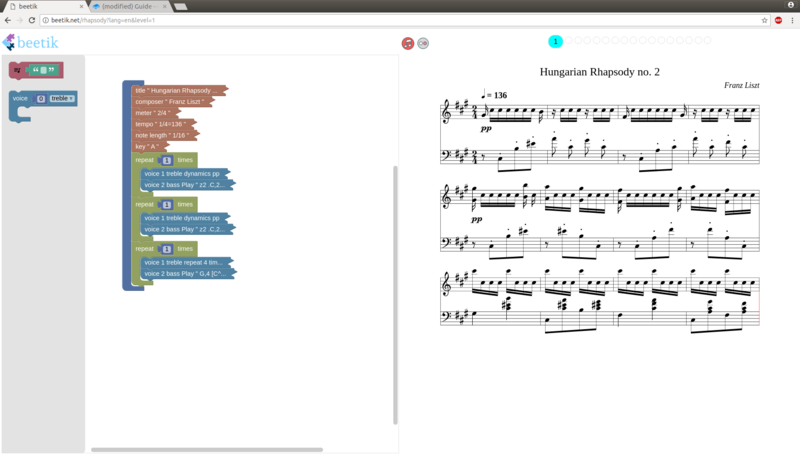 In this lesson, we will reconstruct a small part of Franz Liszt&apos;s Hungarian Rhapsody no. 2. Use the buttons at the top to play the music and proceed to the next step as you go along. Pay attention at how the music evolves as you recompose it. En esta lección vamos a recrear la rapsodia húngara no. 2 del compositor Franz Liszt. Usa los botones para reproducir la música y proceder al siguiente paso. After clicking the close button you will see the environment. Kids should click on the red button to hear the music created by the blocks and then click on the next level button which will proceed to the next level.